Kyle Mooney has an unearthed a rare, never before seen episode of Brigsby Bear which he's sharing with his fans today! Now you can experience firsthand the newly discovered footage from James Pope's beloved TV series. Just don't get too curious. Cause that would be very bad. Brigsby Bear Adventures is a children's TV show produced for an audience of one: James (Kyle Mooney). When the show abruptly ends, James's life changes forever, he sets out to finish the story himself and must learn to cope with the realities of a new world that he knows nothing about. Now, we get to see one of the episodes of Brigsby Bear that James grew up with. One of James favorites, this is Brigsby Bear adventure Volume 23 Episode 14 titled 'The Festival of Kindness'. In the episode Brigsby Bear discovers that Arielle has been replaced by an evil robot. There's some very funny, weird shenanigans, laser whips, and a lot of big bears hiding behind very small rocks. Fans of Mark Hamill's voice work will surely recognize Mark Hamill's contributions as the voice of Brigsby Bear right away. The movie is good hearted and sweet, despite being about child kidnapping. Hamill stars as James' 'adoptive' captor-father, who brainwashes the young child all the way into adulthood with self-produced episodes of the Brigsby Bear TV show. Every week in an abandoned warehouse full of children's TV show props, Hamill's Ted produces a new episode of Brigsby to keep James indoctrinated and fearful. James is one brainwashed kid. With Brigsby often imparting his most important life lesson: Curiosity is bad! In this fake TV show, Mark Hamill has Ted starring as the title character Brigsby. Though, it's unclear if they actually made the once and future Jedi master actually crawl into that Bear costume. 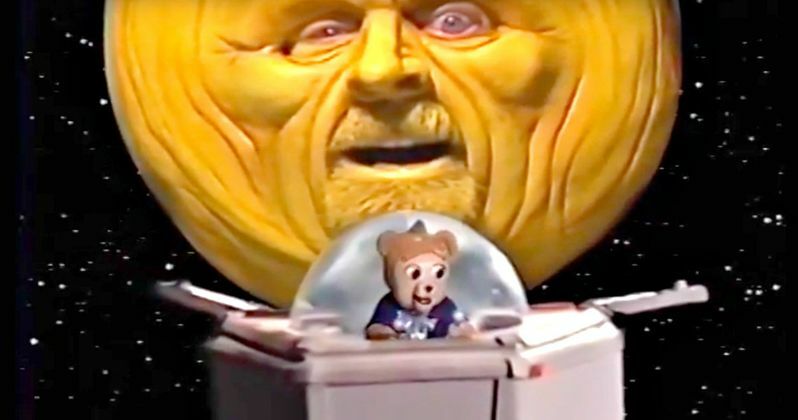 Not only is Hamill playing Brigsby all these years, but he also plays a malevolent Sun God which is reminiscent of Georges Melies A Trip to the Moon and The Moon from The Mighty Boosh, another real-life kids' show gone off the rails in gleeful and subversive ways. Mark Hamill and Kyle Mooney lead a powerful ensemble cast that also includes SNL player Beck Bennett along with Claire Danes, Jorge Lendeborg Jr., Greg Kinnear, Kate Lyn Sheil, Ryan Simpkins, Matt Walsh and Michaela Watkins. Dave McCary directs the movie, with a screenplay by Kyle Mooney and Kevin Costello. Sony Pictures Classics will deliver the movie in theaters with a PG-13 rating. Jane Adams, who can also be seen in this long-lost episode, helps husband Ted create these shows, which teach and guide James to be a very scared man filled with nothing but a love for nostalgia, so much so, it wrecks havoc on his future life once he's freed from his captors. The Brigsby Bear show encapsulates everything James knows about the real world. And when that is ripped away from him, he doesn't know what to do with himself. Brigsby Bear kicks off with James being discovered by law enforcement, who find him and bring him back to the real world. There, he finds he has no real friends and decided to retreat to his past by recreating the ultimate lost episode of Brigsby Bear, as seen in this video from Matt Reeves Youtube. The idea of casting Mark Hamill as the star of the show is quiet Meta, as many former children feel the same way about Star Wars today, and it speaks very loudly to the crowd who are only living to get to the next chapter in the Skywalker family saga. Curiosity about new friends is bad. Stick to the franchises you know, and you'll be okay. Even if they do nothing but whip you with a laser beam on a constant, painful basis. Contributing writer for Movieweb since 2001. Owns a dog who loves watching Milo and Otis on repeat. Emperor Palpatine Isn't the Only Surprise Return in The Rise of Skywalker?